A steaming hot bowl of chowder chases away a cold winter’s day! This Healthy Corn and Shrimp Chowder comes together quickly, and is chock full of delicious and healthy ingredients… It’s gluten-free, and can be made dairy-free as well! Much of the U.S. is caught in winter’s icy grip. Even south Texas has spent much of early winter in the thirties and forties (not the “norm” by about 30 degrees!). Nothing warms the body and soul like a hot, hearty bowl of soup! The “recipe” such as it is for Healthy Corn and Shrimp Chowder goes back about 38 years. I no longer have the hand-written recipe from my sweet mother-in-law, and I’ve certainly taken a lot of liberty with it over the years, but my current version always brings me back to my days as a young bride and making this favorite family recipe. As I mentioned, I take a lot of liberty with the original corn and shrimp chowder recipe. I don’t always make it dairy-free, but I wanted to see if I could get close to the original with dairy-free milk rather than the original (canned milk) or my preferred half and half. I used So Delicious Dairy Free Creamer “Original.” Nut milk would probably work well, but I find the creamer adds the additional body to the chowder that more closely matches half and half. Obviously this Healthy Corn and Shrimp Chowder has shrimp. Living on the Gulf, we have access to all the sizes and types of shrimp. I prefer the Gulf peeled and deveined 31 to 35 count, and I just toss them in whole. The original recipe called for canned salad shrimp. They’re absolutely fine! You can use larger ones and chop them up a bit, but why would you use the expensive larger shrimp just to cut them up? Haha. The “secret” ingredient in the flavorful soup is a can of creamed corn. Okay. I know. I rarely specify canned anything. However, it is essential to the flavor of this wonderful shrimp chowder (and an ingredient in the original). Of course there are veggies… as many as I can reasonably pack in there – multi-colored new potatoes, shredded carrots (also original), and chopped red bell pepper. My rendition of the recipe evolved to include de-glazing the pan with dry sherry; it adds so much flavor! Lest I forget, the pot of soup starts out with bacon. Because. Bacon. If you must, leave out the bacon, and substitute a generous drizzle of olive oil; be aware that it will taste different! A steaming hot bowl of chowder chases away a cold winter's day! This Healthy Corn and Shrimp Chowder comes together quickly, and is chock full of delicious and healthy ingredients... It's gluten-free, and can be made dairy-free as well! To a heavy dutch oven or sauce pan over medium-high heat, add the bacon pieces. Cook until crispy, stirring frequently. Remove pieces with a slotted spoon to drain on paper towels. Reserve for garnish. Remove all but 1-2 tablespoons of bacon fat. Add the onion, garlic, and crushed red pepper. Saute until onion is translucent and garlic is golden but not browned. De-glaze with dry sherry. Add thyme and bay, stock, potatoes and shredded carrots. Stir to combine. Bring to a boil, reduce to a simmer, and cover. Cook 5 minutes on a simmer. Add the bell pepper, and cook an additional 5 minutes. Add the milk or half and half, creamed corn, and shrimp. Cook another 5 minutes. Taste and season with salt and pepper. Seafood stock is widely available. Chicken stock is not a good substitute. A simple shrimp stock can be made with shrimp shells. Whenever I peel shrimp, I pop the shells in a zip bag until I have enough to make stock. If I don't have any in my freezer, I use Kitchen Basics Seafood Stock. As I mention in the post, this recipe can be made with milk, nut milk, half and half, etc. There are many dairy-free options. My personal preference is So Delicious Original Coconut Creamer as it adds body similar to half and half. Keep in mind the macros will vary based on your milk choice, thickness of bacon, etc. If you wish to skip the bacon, add a generous drizzle of olive oil, and skip to the second step (sauteing the aromatics). Macronutrients (approximation from MyFitnessPal.com): 471 calories; 36 g protein; 49 g carbohydrates; 9 g fat. « Best Ever Chocolate Meal Replacement Smoothie with Orange, and Pomegranate! I made this tonight - fortunately, I doubled it so we have some for this week and I froze some. YUMMMMMMY! I made it as written, except I seem to have run out of bay leaves, and I used whole milk for the liquid. Tamara, you are a very gifted recipe creator! I have a few more of yours on the schedule for this week. 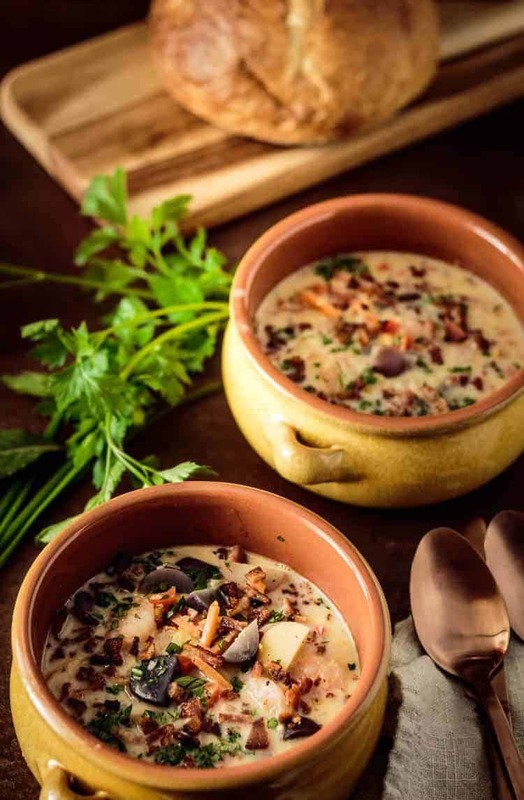 This chowder looks so hearty! Just what you need when it's chilly outside. Perfect comfort food! Thank you Elena! Winter seems to have left us (finally) but we did have one here in south Texas, and it was perfect on those chilly days! Seems very much comfort meal during these chill days. The ingredients you use gives so much flavors. Looks delicious chowder İ've seen this week. Thank you for sharing. It's definitely a "comfort food" type of chowder for chilly winter days. Thanks for stopping by! If anything sounds like a soul warmer, it would be this soup for sure! This looks like a bowl of pure comfort! I love soup all year round. I even eat them in the summer. One of my favorite characteristics in soup is the texture that corn gives. It seems to have just the right bite, don't you think? Yours looks amazing, thanks for sharing your recipe! Yes, the creamed corn gives it a really nice texture, and a hint of sweetness that goes really well with the shrimp. Thank you Tina! I love all the additions here, how wonderful is the chowder!Amazing clicks too. Thank you Loreto! 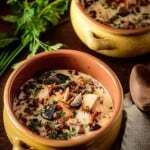 There are some nice layered flavors in this chowder, and it is so comforting on a chilly day! It's Friday... Enjoy your weekend! Oh I'm like you I don't like to waste anything either. I save them in a zip lock bag when I have enough I make a hearty fish stock to add to my storage. This chowder sounds so flavorful. Yay for like-minded souls and not wasting! If you've got the hearty fish stock, you ought to give this chowder a try! 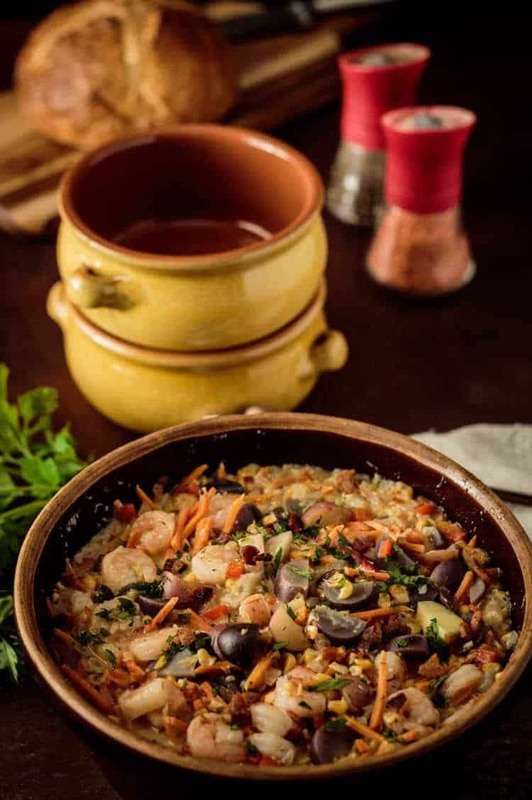 I can just imagine how this corn and shrimp chowder tastes just by looking at your photos! I love how chunky the chowder is!! I love the addition of the sherry!! Great combo with the rest of the ingredients! I agree with you about shrimp stock. I always save my shrimp shells and boil them when a recipe calls for raw shrimp and the shrimp with shells was cheaper. This soup sounds amazing. I'm a big fan of corn chowder, and adding shrimp can only make it better. I've pinned your recipe, and I can't wait to try it. I grew up with "waste not, want not" Patti! I have zip bags of all kinds of stock components, and make a batch when I have enough. Most recently, my husband and our son went fishing in the Gulf. Rather than pay deck hands, they brought the fish home to clean them as our son is a professional chef. He cleaned 9 large fish, and we got about 12 cups of fabulous fish stock! I hope you try the chowder... it really is delicious! Yum.....this looks really healthy and great! Nice photo too! This recipe looks so cozy! I've been so into corn chowder recently... I can't wait to try this recipe. It looks so creamy!